CLEVELAND (AP) — The Los Angeles Chargers won’t spend their lengthy lay-over for London mulling a loss. 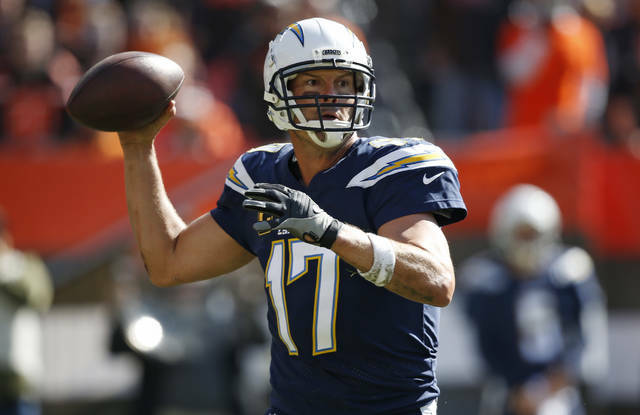 Powered by a dominant running game, big plays from quarterback Philip Rivers and a rookie kicker who didn’t miss in his NFL debut, the Chargers rolled to a 38-14 win on Sunday over the Cleveland Browns and rookie QB Baker Mayfield, who got little help from his teammates. 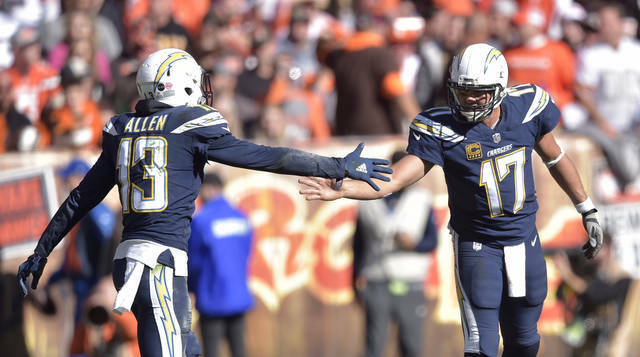 Nearly two years after leaving FirstEnergy Stadium in disgrace after the Browns beat them for their only win in 2016, the Chargers (4-2) won their third straight and made sure their next few days would be enjoyable. Los Angeles will stay in Cleveland before flying later this week to England to face Tennessee on Sunday. And that’s no knock on Cleveland. 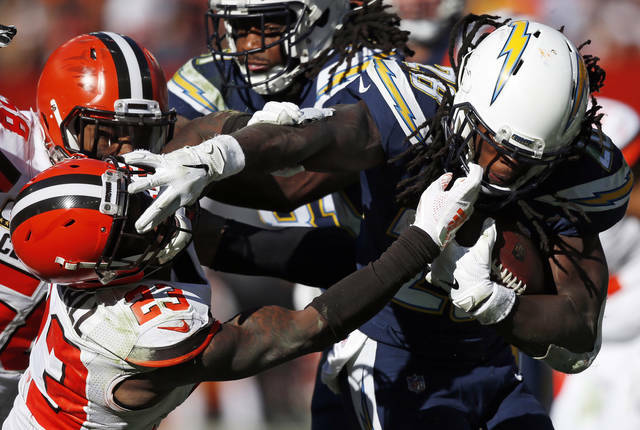 The Chargers played their best all-around game this season against the Browns (2-3-1), who were competitive in their first five games but were overwhelmed by a Los Angeles team that might not be getting the attention it deserves. Melvin Gordon rushed for three touchdowns and 132 yards, Rivers connected with Tyrell Williams on two TDs and San Diego’s defense sacked Mayfield five times and twice intercepted the No. 1 overall pick . The Chargers rushed for 246 yards on 36 carries, eating up yardage and time while taking some pressure off Rivers. Gordon scored on runs of 4, 10 and 11 yards for his first career three-TD rushing game. For Mayfield, his third career start was a tough lesson. He tweaked his ankle when he slipped on the sideline in the first quarter, and Mayfield was plagued by a few costly drops, including two by rookies Antonio Callaway and Damion Ratley in the first half that could have been TDs. Rivers complimented Mayfield for battling through a difficult day. “He’s a gritty, tough and competitive guy,” Rivers said. “He has a heck of a career ahead of him. He made some really good throws today that were close. If I wasn’t pulling against him to beat him, I would’ve said ‘You should’ve caught those.’ There were a couple of them that I thought they should’ve caught, but I’m glad they didn’t. For once, the Chargers stayed between the uprights. Rookie Michael Badgley kicked a 44-yard field goal and made all five PATs in his debut. He was signed Thursday and filled in for Caleb Sturgis, who has a quad injury and accuracy issues. Lynn said he’s comfortable with Badgley, but left his kicking plans undecided. Cleveland’s defense yielded yardage in huge chunks. The Chargers had 12 offensive plays gain more than 15 yards, with seven picking up 20 or more. “They punched us in the mouth early, up on the opening drive and they were just doing some things that obviously we couldn’t stop,” said safety Damarious Randall, who was in position to intercept Rivers in the end zone but had the ball pulled away by Williams for a 45-yard TD. The Browns’ extensive injury issues at wide receiver worsened when Rod Streater suffered a neck injury in the first quarter. Streater’s loss left Jarvis Landry, Callaway and Ratley as the only healthy receivers. Ratley briefly left in the fourth quarter with an injury but finished with six catches for 82 yards. Cleveland signed free agent Breshad Perriman on Saturday, but he hasn’t had time to learn the playbook and was inactive. Rashard Higgins (knee) and Derrick Willies (broken collarbone) are both out. Jackson conceded the Browns need help.